"Sampath Speaking" - the thoughts of an Insurer from Thiruvallikkeni: human cargo of slaves in Transatlantic voyages ~ insurable interest - mortality by mutiny !!! human cargo of slaves in Transatlantic voyages ~ insurable interest - mortality by mutiny !!! Amistad, ran full houses in 1997 ~ a historical drama film directed by Steven Spielberg based on the true story of an uprising in 1839 by newly captured African slaves that took place aboard the ship ‘La Amistad’ off the coast of Cuba, the subsequent voyage to the North-eastern United States, and the legal battle that followed their capture by a U.S. revenue cutter. It shows how, even though the case was won at the federal district court level, it was appealed by President Martin Van Buren to the Supreme Court, and how former President John Quincy Adams took part in the proceedings. The film begins in the depths of the schooner La Amistad, a slave-ship carrying captured West Africans into slavery and is a touching story of the travails of the humans who were traded as slaves those days. 'The transatlantic slave trade is the largest forced migration in human history and has no parallel in terms of man's inhumanity to man. This trade in enchained bodies was a highly successful commercial business for the nations of Europe'. Their stories make a traumatic reading - slaves laboured mainly in sugar and coffee plantations and were forced to work around the clock in the fields during harvest. 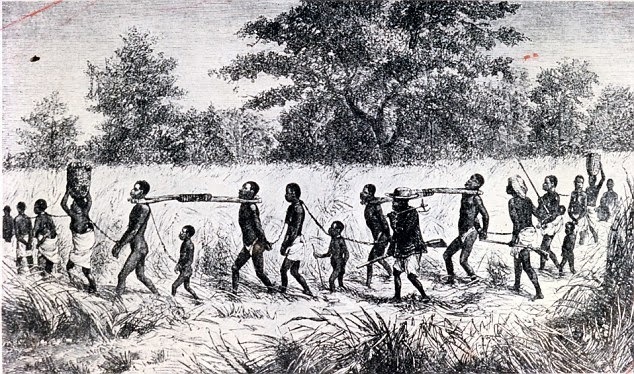 It is stated that by the 18th century, European traders would sail to the west coast of Africa with manufactured goods which they exchanged for people captured by African traders. The European merchants would then cross the Atlantic with ships full of slaves on the notorious 'Middle Passage'. Conditions were so torrid that many of the captors, who often had barely any space to move, did not survive the journey. For those who survived, conditions did not improve much; they were to toil on plantations across the modern-day United States, the Caribbean and South American nations such as Brazil, producing crops including sugar, coffee and tobacco for consumption back in Europe. Happy that the inhuman form was abolished many decades back ! 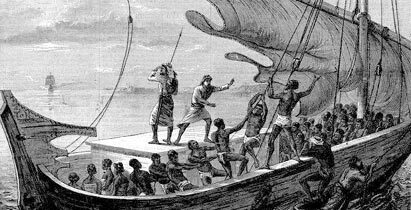 Called ‘Slaving voyage’ – early ones were of John Hawkins is considered to be the first English slave trader. He left England in 1562 on the first of three slaving voyages. In 1563 he sold slaves in St Domingo, his second voyage was in 1564 and his final, and disastrous voyage was in 1567. In 1764, a one-hundred ton brigantine called the Sally embarked from Providence, Rhode Island, to West Africa on a slaving voyage. The ship was owned by Nicholas Brown and Company, a Providence merchant firm run by four brothers – Nicholas, John, Joseph, and Moses Brown. The Sally's voyage was one of roughly a thousand transatlantic slaving ventures launched by Rhode Islanders in the colonial and early national period, and one of the deadliest. Of the 196 Africans acquired by the ship's master, Esek Hopkins, at least 109 perished, some in a failed insurrection, others by suicide, starvation, and disease.Records of the Sally venture are preserved in the John Carter Brown Library at Brown University, as well as in the archives of the Rhode Island Historical Society. In the second half of the eighteenth century six imperial systems straddled the Atlantic each one sustained by a slave trade. The English, French, Portuguese, Spanish, Dutch, and Danish all operated behind trade barriers (termed mercantilistic restrictions) and produced a range of plantation produce - sugar, rice, indigo, coffee, tobacco, alcohol, and some precious metals - though with sugar usually the most valuable. It was totally inhumane, of capturing, chaining humans and transporting them herding them into confined space, traded off for commodities and money. There was insurance too; owners had insurable interest on the lives of slaves – yes, Marine Cargo Insurance, as slaves were treated as ‘cargo’- commodity and not humans. A search reveals that in 1856, just five years before the outbreak of the Civil War, the Charter Oak Life Insurance Company printed a pamphlet offering slave owners in six Southern states the option of insuring the lives of their slaves.For just $2, Kentucky, Missouri and Tennessee residents, for example, could purchase a 12-month policy from the Hartford-based insurer on a 10-year-old domestic servant that would yield $100 if the slave died. Policies for older slaves, like a 45-year-old, were more expensive, costing the slave owner $5.50 a year.Though the company no longer exists, these policies are drawing increasing attention nearly 150 years later because of a lawsuit that was filed in United States District Court in Brooklyn, against Aetna Inc. and two other companies, claiming that they profited from the slave trade. Whilst slaves were regarded by Jurists of civilized and Christian Europe as mere livestock, it was gravely determined that death self-inflicted under the horror and despair of their condition was a loss arising from the proper vice and inherent pravity of the thing insured, and not chargeable, therefore, to the Underwriters !!! The Courts were even under the pain of listening to solemn arguments in support of the position that loss from throwing overboard part of human cargo of an overloaded slaver, owing to scarcity of water, fell upon the Underwriters as being due to ‘perils of the sea’. 1. That all the slaves who were killed in the mutiny, or died of their wounds, were to be paid for. 3. That all who had swallowed salt water or leaped into the sea and hung upon the sides of the ship without being otherwise bruised, or died of chagrin, were not to be paid for. In those black days of slavery and transhipping humans in most inhumane conditions, policy terms and conditions were clearly drawn and those days it was decided that where slaves died on the passage from scarcity of food caused by the extraordinary and unavoidable delay of the voyage, were considered as natural death, for which Marine Underwriters were not liable. Humiliating as they are to recall these cases so unfavourable to any civilized Nation’s probity that those principles are now applicable only to insurances of livestock. It is another matter in History that these Nations ruled others for centuries trying to educate moral values too, to those under their domain.